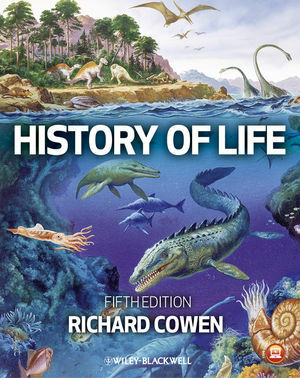 This text is designed for students and anyone else with an interest in the history of life on our planet. The author describes the biological evolution of Earth’s organisms, and reconstructs their adaptations to the life they led, and the ecology and environment in which they functioned. On the grand scale, Earth is a constantly changing planet, continually presenting organisms with challenges. Changing geography, climate, atmosphere, oceanic and land environments set a stage in which organisms interact with their environments and one another, with evolutionary change an inevitable result. The organisms themselves in turn can change global environments: oxygen in our atmosphere is all produced by photosynthesis, for example. The interplay between a changing Earth and its evolving organisms is the underlying theme of the book. The book has a dedicated website which explores additional enriching information and discussion, and provides or points to the art for the book and many other images useful for teaching. See: www.wiley.com/go/cowen/historyoflife. Richard Cowen learned how to write and think critically at Cambridge University, and how to teach and think creatively at the University of California, Davis. He received a campus Distinguished Teaching Award in 1993 and designed the course “History of Life” there. The book was written specifically for that course, and has gone on to become a best-selling textbook.